Mayor Goofy Borneman was the first elected mayor of Rabbit Hash. 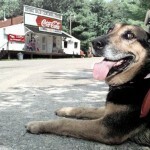 Born of unknown parentage and adopted in 1985 by the Borneman/Calhoun family of Rabbit Hash, Goofy was raised as any local dog-resident of the town. His early years were happy ones, playing with the Bornemans’ son, Mike Calhoun. According to Mike, it was the standard boy-dog relationship with Goofy a constant companion for Mike as they traveled up and down Lower River Road. While Mike was in school, Goofy would still take the familiar path between his home and the Rabbit Hash General Store visiting neighbors and eating any scraps along the way. In his adolescence, Goofy ran into trouble. Lounging in the road proved to be a dangerous past-time as he was hit by cars more than once. He also had a stinky reputation and fell into trouble with his owner, Ed Borneman, when Goofy was allegedly found to be poaching town chickens. In his older years, Goofy settled down and was content to remain on the straight and narrow. 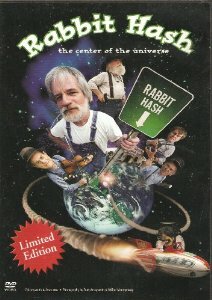 In June 1998, upon Boone County, Kentucky’s bicentennial celebration, the Rabbit Hash mayor’s race was announced. Although initially open to anyone in the area, only humans entered the race. After Jane and Randy Cochran entered their black Labrador Retriever, Herb, in the race, the Borneman family, finding that everyone in the town already held a relationship with their aging dog, Goofy, decided to enter him. The charisma of the Borneman family and the notorious reputation of Goofy led to a triumphant result as Goofy beat out famed woodcarver “Crazy Clifford” Pottorf and fellow four-legger Herb Cochran. Unfortunately for the town, the aging mayor did not get to serve an entire term, however long that may be, and passed away in July of 2001 at the astounding age of 16. Although his burial-in-landfill was lacking the traditional pomp and circumstance of a funeral for a notorious politician, his reign over the town was celebrated in a parade at the 2001 Old Timers Day. His legacy continued with the release of the 2004 documentary Rabbit Hash: Center Of The Universe, which focused on his election, and the 2004 and 2008 runs and wins for Junior Cochran and Lucy Lou respectively. Having set the precedent for canine mayors, Goofy and his tradition has brought an overwhelming amount of positive attention and funds for the preservation of the aging river town. To Goofy and to the Borneman family, we are eternally grateful.